Is it time you drastically reduced your sugar intake? We all know that eating too much sugar isn’t good for you but it’s so hard to quit. Maybe you just need to detox from sugar. If you’ve been diagnosed with cancer you need to stop eating sugar ASAP. There is plenty of information available about how sugar feeds cancer. For the rest of us, we need to reduce our sugar intake because it will make us healthier and decrease our chances of cancer. Reduced inflammation and better sleep are also side effects. It’s easy for me to overeat sugar so when I feel like things have gotten out of hand I put this 7 day plan into action. In this 7 day detox I’m not suggesting that you take out fruit or things that taste sweet. Try this first and see how you feel. If it doesn’t help then you may need to take out the fruit. Each day you’ll focus on something different and before the week is over you’ll be on your way to breaking your sugar habit. There are lots of methods for quitting sugar. I’m just telling you what I do. Also, some people suggest going cold turkey. I haven’t been able to do that. I typically don’t use honey as a natural sweetener because I don’t care for the taste. I do use different types of stevia depending on my needs. I use Kal Organic Stevia for my coffee and I use Pyure Organic Stevia Blend for baking. I know this can be a pain but keeping track of the sugar you eat is really helpful when detoxing from sugar. Write down everything you eat and drink. At the end of the day add up how many grams of sugar you’ve consumed. To figure out how many teaspoons of sugar you’ve had 1 teaspoon of sugar has about 4 grams of sugar in it. So take your total grams and divide them by 4. How many teaspoons of sugar have you had today? If you need a visual aide, grab the sugar jar and measure it out into a bowl. If you’re anything like the average American, it will be quite a lot of sugar. Seeing the amount will help you make it through the next five days and work hard at cutting back on the sugar you consume. This is a great idea to use for helping your kids reduce their sugar. There’s a lot of sugar hiding in our favorite drinks. Today I want you to focus on cutting those sugary drinks out of your diet. That means no soda/soft drinks, no fancy creamers in your coffee, no sugar in your tea, and no fruit juices. Pay attention to everything you drink and if it has sugar, skip it. Stick to water, club soda, black coffee (with milk or cream), and unsweetened tea. The best thing you can do for yourself is to learn to drink plain filtered water. If you just can’t drink plain water try adding lemon wedges. If you are a heavy soda drinker then allow yourself 1 soda a day for a week if you want to ease off of them. Then just allow yourself soda once a week and then once a month. I won’t try to scare you with how bad soda is for you. I think that’s public knowledge by now. Drinking kombucha or carbonated water helps me stay off soda. It’s the fizz that I love in soda so the carbonated water or Kombucha gives me that bite. Kombucha has healthy probiotics so that’s the bonus of drinking it. You can easily make Kombucha at home or pick one up at most grocery stores. Just watch out since many of the store brands have added sugar. Today we’ll change up breakfast. Instead of grabbing a bowl of sugary cereal, a breakfast bar, or a donut, go for something without sugar. Fry up some eggs and bacon or high protein pancakes (get my recipe here). Peruse Pinterest for sugar-free breakfast ideas. There are so many options but it will take some experimenting to find something you enjoy. If you are not hungry for breakfast then you may want to start Intermittent Fasting(read about it here). There is no evidence supporting breakfast but you do need a plan for when you break your fast. Otherwise, you could end up eating a bunch of junk. Typically, I intermittent fast every day. I stop eating at 6 pm and don’t eat again until about 12 pm the next day. I break my fast with a low glycemic meal replacement shake (this is my favorite brand- buy a sample back to try them) so I get good nutrients in my body right away. Intermittent fasting helps me stay on track with eating healthy, I don’t meal prep, and it keeps me from thinking about food all day (as strange as that sounds). Once you get the hang of fasting you will have more energy, fewer junk cravings, and most likely you will lose some weight if you need to. I know it seems drastic but you need to give up dessert. If you eat enough at dinner you shouldn’t still be hungry. Try adding more fat, fiber, and more protein to your meal. If you must have something sweet have a few berries at the end of dinner. Even a bit of peppermint oil (get it here) on your tongue or just a whiff of peppermint can reduce the sugar craving. Whatever you do, don’t order dessert at a restaurant. It’s easy to overeat sweets especially when you are not at home. Sugar at the end of the meal is just a bad habit not to mention all the extra calories. Some people might disagree with me but I think we all do better detoxing from sugar when we have a few healthy dessert replacements. Don’t eat them every day but have a few in your arsenal so when you are really craving sugar you can eat them instead of your regular sugary treat. 1.Start with fruit as your first line of defense against the sugar monster. 2. Make mock ice cream with frozen banana slices, cream, and vanilla in the blender. 3. If you like cookies, try these chocolate chip cookies. They are simple to make but won’t give you that sugar spike and dip. 4. Try a healthy meal replacement shake (my favorite here). When I have a protein shake during the day for lunch I feel full and I get that sweet taste without the junk. If you try a shake to curb cravings make sure it contains fat and fiber so it’s low glycemic and won’t affect your blood sugar. Warning: Don’t eat too many of your “mock sweet treats” because you will eat too many calories. Usually, my favorite “mock sweet treats” have a lot of fat which means extra calories. Protip: If you are having a really hard time ditching sugar then you need to skip this idea. Some people need to go cold turkey and avoid the sweet flavor altogether. Start watching out for hidden sugars. Get into the habit of reading labels and avoid things like low-fat salad dressing. Believe it or not, fat is your friend. If you’ve been on a LOW FAT diet you could be consuming more sugar than you think. I found when I went back to full-fat cheese and salad dressing I felt more satisfied. Stay away from high fructose corn syrup. Cook what you can from scratch so you have control over what is in your food. Make this the day you go thru your cupboards and take inventory of the foods you need to find lower sugar options for. Some people might need to clean out the pantry right away. If you don’t want to waste food just make it a point not to buy that food again. When you shift to making more meals from scratch it should be easier to reduce the amount of sugar in your foods. Breads don’t generally have a lot of sugar but they process in your body just like sugar. Often times, when you eat bread you will crave sugar later in the day. When you stop eating bread and crackers you will often stop the carb/sugar cycle that’s so easy to get into. If I’m not careful I can eat 2 servings of crackers just on the way home from the grocery store. I’ve made it a habit to have some nuts in my purse for a snack without throwing my blood sugar for a loop. Find alternatives to pasta. I don’t know about you but pasta always makes me crave dessert. Instead of pasta, you can try using these Miracle Noodles (get them here) or spaghetti squash. 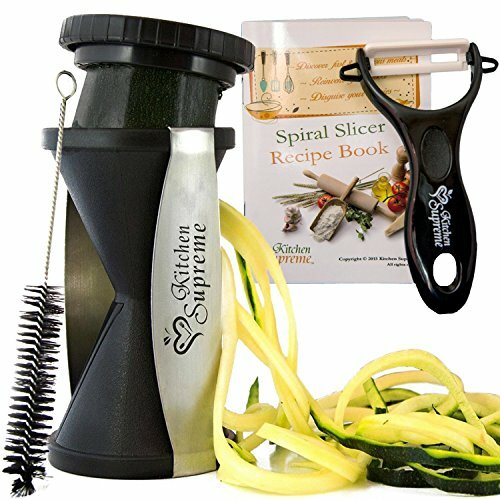 You can even spiralize your zucchini with that nifty tool. If you just can’t quit bread try sourdough bread or the dense bread like Ezekial bread. I try to avoid bread during the week but may enjoy a burger on the weekend or garlic bread when we eat out. Think You Could Do The 7 Day Sugar Detox? Do you think the above steps could help you detox from sugar in a week? You may not be perfect and there will be days you want to indulge but don’t let it spiral out of control. It will take some work to reduce your sugar intake. The 7 steps above will get you on the road to beat the habit. I have to be especially careful because I have a habit of binging which can easily get started when I have even 1 cookie. Here are some other tips to help you reduce your sugar cravings. You can try these after you tried the 7 Day Sugar Detox or you can incorporate them into your plan. In fact, drinking a low glycemic whey protein shake is one of the easiest ways to reduce your sugar intake. It will even out your blood sugar and keep you feeling full. 3. Take A Good Multivitamin – Many times our food cravings are due to nutrient deficiencies. Taking the right nutrients feeds your body what it needs which reduces your sugar cravings. 4. Get More Sleep – If you are tired you are more likely to reach for sugar to give you an energy boost. Try to get a good nights sleep. If you are tired, try drinking coffee or tea to wake up rather than having sugar. Dave takes melatonin and extra protein at night to help him sleep better. The combination he takes is called the Bedtime Belly Buster as it helps with belly fat too(read about it here). 5. Manage Your Stress – We all know about stress eating. When we are worried about something we tend to grab our favorite comfort foods. For me, that’s usually sugar. Do your best to find other ways to deal with your stress such as exercising, talking to your friend, or watching your favorite TV show. Whatever you do, don’t start eating sweet food. You will only end up binging and feeling worse than you did before you started. 6. Drink More Water– Sometimes we just need a drink of water when we think we are hungry for junk. Our body needs more water than most of us consume on a daily basis. Try adding lemon or mint to your water to liven it up. 7. Try Essential Oils – Don’t forget this free E-Book about using oils to help curb your cravings. 8. Cleanse – I’ve found when I regularly use the Isagenix products along with intermittent fasting I don’t have as many cravings. The Cleanse For Life product (read more) cleanses the toxins and gives me the nutrients my body needs. Read up on their 9 Day Cleanse and a 30 Day Cleanse. The sugar detox and tips should help you beat sugar. Just don’t give up. There will be days that you eat sugar but it doesn’t have to consume you. I find it’s easier to reduce sugar when I make it about my long-term health. Do you struggle with sugar? Think these ideas could help you? What is Bubble Tea and Boba Tea?